USS Ronald Reagan (CVN 76) steams in close formation as one of forty-two ships & submarines representing 15 nations during RIMPAC 2014. In the background is JS Ise (DDH-182). Over at Bloomberg View, Josh Rogin explores the somewhat muddy topic of China’s participation in the world’s largest naval exercise, known as the Rim of the Pacific Exercise (RIMPAC, for short). The biennial exercise is led by the United States’ Pacific Fleet and, as of its last iteration in 2014, included 22 participants and 6 observers fielding 47 surface ships, six submarines, over 200 aircraft, and 25,000 troops. Rogin notes that, somewhat unsurprisingly, prominent voices in Washington are against the idea of including China in the exercise going forward. China participated in RIMPAC 2014 for the first time ever, but there may be little to gain by inviting it back to participate in 2016. In fact, the United States may have more to gain by excluding China from the exercise going forward, barring a major shift in China’s behavior. Amid China’s increasingly assertive and norm-defying behavior in its near-seas—the East and South China Seas, to be specific—and continuing militarization, the United States would have sufficient reason to bar China’s participation. U.S. Senator John McCain (R-AZ) notes: “I would not have invited them this time because of their bad behavior … In the last number of years they had filled in 60 acres of land around these islands; in the last year they have filled in 600 acres and they are putting in a runway. I don’t think there is any doubt about their territorial ambitions.” McCain highlights China’s ongoing land reclamation activities on disputed features in the Spratly and Paracel Islands, a topic The Diplomat has covered in some detail recently. For the United States, having China participate in RIMPAC is one way to bridge a perceived and real gap in military-to-military relations between the two countries. The U.S. and China, while competitors, both try to demonstrate goodwill toward the other’s military through a range of activities. For the United States, this means including China in events like RIMPAC, and for China, it means giving the U.S. Secretary of Defense a tour of its new aircraft carrier and carrying out regular senior defense exchanges. Overall, all of this has yielded little in the way of tangible benefits to the general state of the U.S.-China relations. Sure, it’ll let the Pentagon add another bullet point to the relatively short list of “military-to-military contacts between the armed forces of the United States and the People’s Republic of China” in its annual reports, but it won’t condition China’s behavior, which is the real problem holding back better relations between the United States and China. If, as McCain and others note, the United States would like China to abide by international rules and norms, it needs to earn its entry into groupings like RIMPAC and other arrangements by behaving in line with those standards. Interestingly, China’s participation in last year’s RIMPAC probably shouldn’t have occurred at all. The United States started the ball rolling on that initiative in 2012, when Defense Secretary Leon Panetta invited China to participate in the exercise. China was perceived very differently at that time, both by the United States and by regional states. Many of the norm-defying events and trends we point to today, including but not limited to China’s land reclamation activities in the South China Sea and air defense identification zone (ADIZ) over the East China Sea, weren’t on the United States’ diplomatic radar. The worst we’d seen was China’s seizure of the Scarborough Shoal from the Philippines in early 2012 (which many analysts at the time, in The Diplomat and elsewhere, noted as a sign that things would only get worse). China accepted the U.S. invitation to RIMPAC shortly after the ‘shirt-sleeves’ summit between Presidents Obama and Xi at Sunnylands; State Councilor Yang Jiechi made the announcement in June 2013. China is happy because it is included in a major naval exercise involving many regional countries — its participation highlights its prestige as a seafaring nation. The U.S. comes off looking more like a benevolent and inclusive leader than the exclusionary hegemon of an anti-China coalition in Asia. 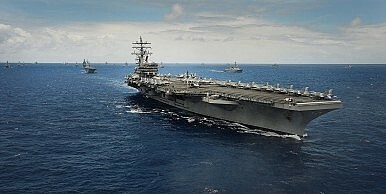 As the title of the Bloomberg View report (“Calls to Punish China Grow”) suggests, U.S. proponents of excluding China from RIMPAC (and possibly other multilateral exercises) see it as primarily a tool for punishing Beijing for behavior the United States deems out of line with international norms. This is absolutely an option that this administration should consider. First, China can’t really credibly revert to the “containment” line, and the United States can in good faith claim that excluding China isn’t an attempt to contain China (even if it may be doing so in reality). Instead, what the U.S. should emphasize is that participation in RIMPAC is contingent on adhering to and respecting a set of international norms and values that China clearly eschews with its brazen unilateralism. In essence, the exercise should be open to those states who respect the principle of freedom of navigation on the open seas (at a minimum). Here, it’s probably a good idea for the U.S. to steer clear of justifying the exclusion of China on the grounds of the United Nations Convention on the Law of the Sea, a treaty that the United States has yet to ratify. Exclusion from RIMPAC imposes, in my view, a very reasonable cost on China for its preference for unilateralism on the open seas. The magnitude is severe enough to condition China’s behavior while not derailing decades of fragile U.S.-China goodwill altogether. Whatever prestige China gained through its inclusion to the United States’ RIMPAC “club” would be lost, and China would be seen as more of a maritime pariah state. To be sure, U.S.-China relations would take a hit in the short-term, but would be back to business as usual in due time (let’s thank the ongoing Bilateral Investment Treaty negotiations for that). Longer term, China would see that the United States is increasingly serious about imposing costs and moderate its unilateralism. The key to achieving this would be for the United States to clearly let China know that it is not being invited back to RIMPAC because of its lack of adherence to international sea-faring norms and values. In a sense, this is similar to the U.S. line on the Trans-Pacific Partnership: no one is containing China economically; it is welcome to join provided it can meet the high standards required for participation. This same approach should apply for RIMPAC. Suppose that the above argument does not hold in reality: China’s RIMPAC exclusion is read by Beijing as an intentional slight and leads to greater assertion in China’s near seas. While that would be a negative development for U.S.-China relations, it would serve to reinforce the United States’ interest in preserving Asia’s status quo to its allies and partners in the Asia-Pacific region. Speaking in New York recently, U.S. Assistant Secretary of State for East Asia Daniel Russel noted that U.S. partners look for constant signs that the country remains committed to its rebalance to Asia policy. China’s expulsion from RIMPAC would send a strong message to U.S.-aligned states that Washington will hold China accountable for its norm-defying behavior. So, there is wisdom to reconsidering Beijing’s invitation to RIMPAC 2016. The United States needs to assess the kind of cooperation that is necessary with China, and moderate the quantity of that engagement as necessary as long as Beijing acts as a rule-breaker. The Obama administration wouldn’t be alone as it pushed back against China’s unilateralism on the open seas. U.S. partners and allies would applaud the decision, and, provided the Philippines wins a favorable verdict against China’s South China Sea claims under UNCLOS from the Permanent Court of Arbitration later this year, international law may back the United States’ judgement as well. Until China begins to face real costs and exclusion for its actions, it won’t alter course. It’s time for the United States to call China out. The “unsafe” intercept occurred on Tuesday in international airspace over the East China Sea.